Neil Parker from Green Witch gave us a talk about the Isaac Newton Group of Telescopes sited on La Palma in the Canary Islands. 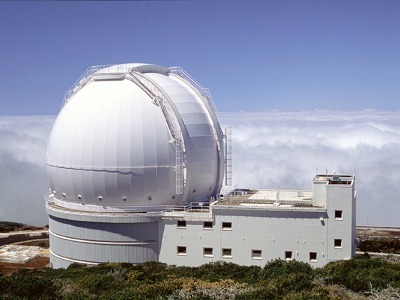 The ING consists of the 4.2-m William Herschel Telescope (WHT – pictured above), the 2.5 metre Isaac Newton Telescope (INT), and the 1.0 metre Jacobus Kapteyn Telescope (JKT), along with ten smaller instruments of various types. The INT has been in use since 1984 but was originally housed in the Royal Greenwich Observatory in Herstmonceux, Sussex (the author remembers seeing it there during a school trip in the late 1960s). Needless to say, the weather conditions in the UK made it impossible to use the telescope to its full potential. The WHT is one of the largest general purpose telescopes in Europe and has been involved in the observations that indicate that the expansion of the universe is accelerating. This work led to a share of the 2011 Nobel prize in physics for Saul Perlmutter in UC Berkeley (announced some weeks after this talk). Neil showed us some enticing pictures of the landscape around La Palma as well as the telescopes, and commented on the engineering required to house and operate these huge instruments. A very enjoyable talk from someone with insider knowledge of this impressive collection of telescopes.